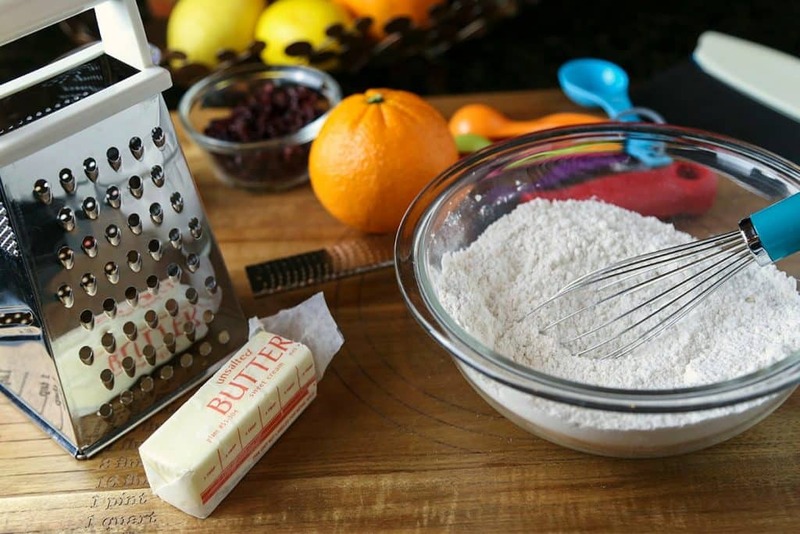 One delightful scone recipe with variations for Chocolate Chip, Lemon, or Cranberry Orange—get creative with your own flavor combinations! 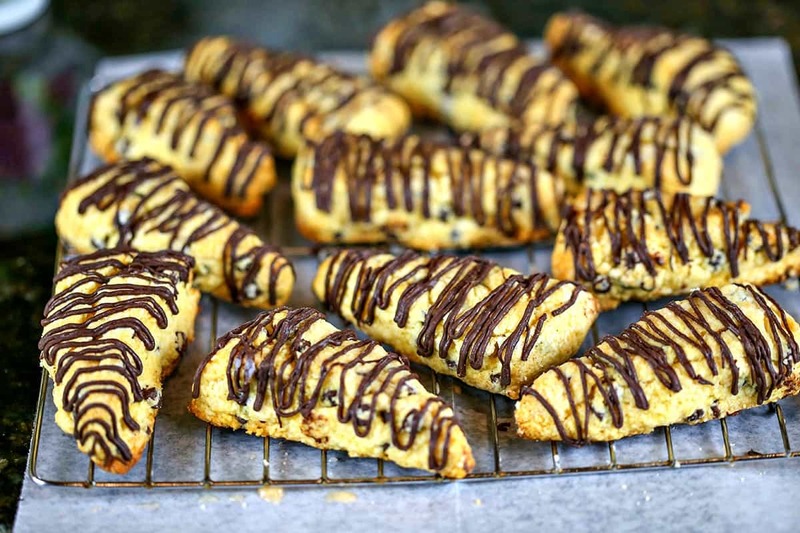 These Mini Chocolate Chip Scones have a wonderful soft, flaky texture and go perfectly with a spot of tea—or coffee, if you prefer! 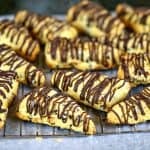 When my friend Karen sent me a text asking if I’d make mini scones for an afternoon Ladies’ Tea at our church, I immediately replied, “I’ll be happy to do that!” Then, my planning mode kicked in. I needed to bake scones for 60-75 ladies and knew I couldn’t do them all the morning of the event. I started making dough, cutting out triangles, and freezing unbaked scones two weeks ahead. By the time I made the sixth batch of Chocolate Chip, Lemon, and Orange Cranberry Scones, I almost felt ready to open my own bakery! When I make scones, instead of cutting the butter into my flour with a pastry blender, I use a box grater and grate frozen butter directly into the bowl. I think this method makes incorporating the butter much easier and effective. Another tip is to avoid over mixing. The dough should be “shaggy” when you dump it onto your pastry board or mat. At this point, use your hands to knead it together and shape into a log. For mini scones, cut the log into eight equal slices, then cut each slice diagonally to make 16 pieces. 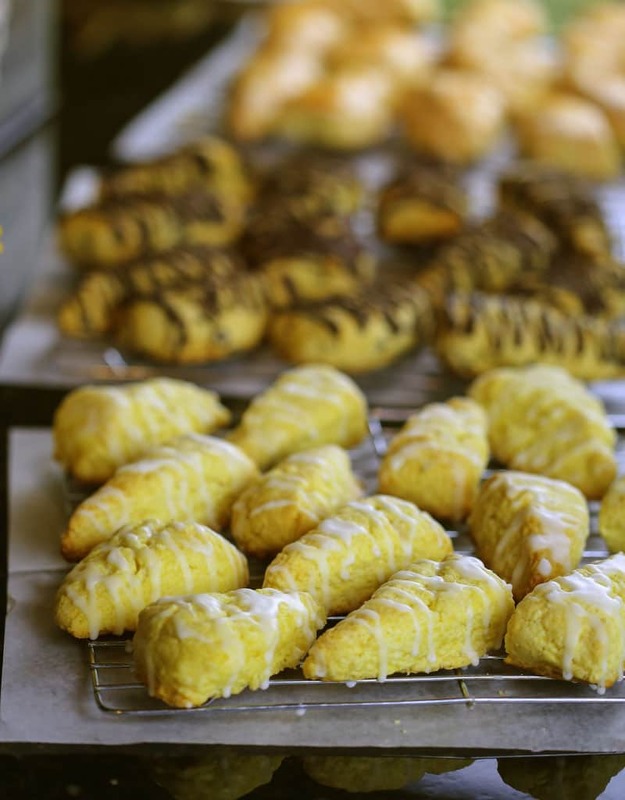 To make scones ahead of time, make the dough and cut it into triangles. Place the scones on a baking sheet lined with wax paper or parchment paper and freeze for a couple of hours. After freezing, remove the scones to a ziplock freezer bag. To bake the frozen scones, add 5-6 minutes to the baking time in the recipe below (no need to thaw first). This recipe uses a box of instant vanilla pudding and includes variations for Chocolate Chip, Lemon, or Orange Cranberry Scones. Get creative and try other pudding flavors and mix ins—the possibilities are endless! 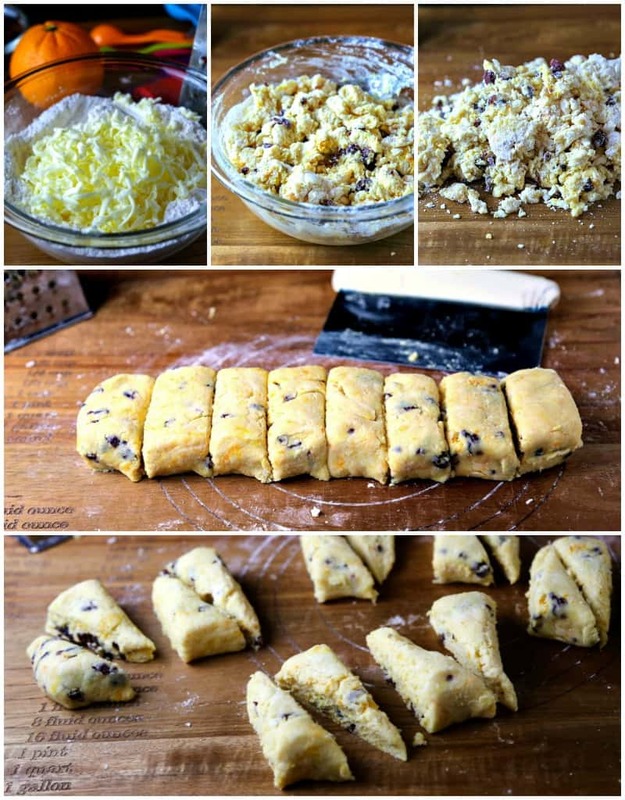 One delightful scone recipe with variations for Chocolate Chip, Lemon, or Cranberry Orange. In a small bowl, combine the heavy cream, egg, and vanilla (or lemon or orange extract). Pour into the bowl with dry ingredients and stir together with a fork, just until the dough becomes shaggy. Add chocolate chips (or dried cranberries) and gently stir with a wooden spoon, leaving the dough shaggy with some flour and chocolate chips not yet incorporated. Empty the dough onto a pastry board or pastry mat and gently knead until the flour is incorporated and the dough is smooth. Shape the dough into a log about 11 inches long and 3-4 inches wide. Cut the log into 8 equal slices, then cut each slice diagonally across. Place on baking sheet about 2 inches apart. Bake for 12-15 minutes or until the bottoms are just golden brown. Cool completely before glazing. Place chocolate chips in a small microwave safe bowl. Microwave for 45 seconds at 50% power, then stir. Continue microwaving in 20 second intervals, stirring in between, until the chocolate is melted and smooth. Place in a pastry bag or ziplock bag with the corner snipped off. Drizzle glaze over scones. Place powdered sugar and salt in a small bowl. Stir in lemon (or orange) juice 1 tablespoon at a time until desired consistency is reached. Drizzle over scones. These look wonderful! Scones are the absolute best for an afternoon tea. 🙂 It looks like you were busy with all of the variety! Thanks for the tip about grating the butter. I will give it a try!